Tennis happens to be one of my favorite sports. Interestingly, I’ve never played it before. Anyway, I followed the 2015 Wimbledon passionately and was disappointed that Nadal has not yet gotten back his winning form. Obviously, the heroic performance displayed by Serena Williams and Novak Djokovic remain memorable. Nonetheless, I remain a die-hard fan of Roger Federer. 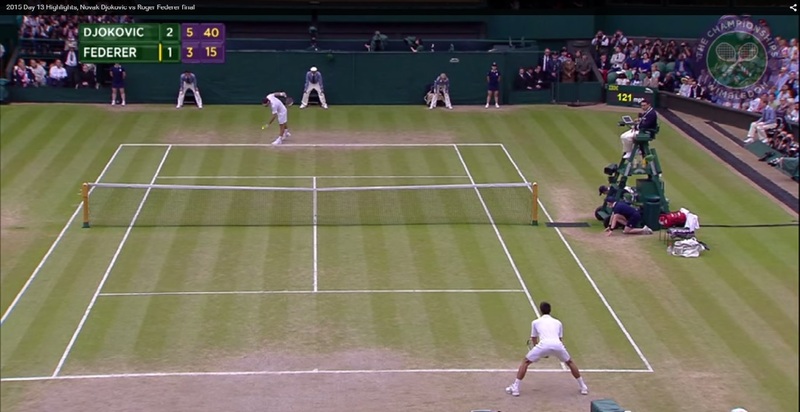 Now, this post is not intended to report the competition but to point out something that struck me as I watched the highlight of the final match between Federer and Djokovic. See the picture I captured from their game below. Chair and line umpires at 2015 Wimbledon. Did you notice that there are several officials on the court? Come to think of it, most spectators will never bother to find out the names of these officials. Although Djokovic carried the day with his remarkable performance, we will forever recall that it was a man named Federer that reached the final of the competition and was outplayed by his opponent. Hence, the players are more important and captivate more attention than the umpires in any game. Guess what? I do not want to be an official (umpire, referee or linesman) in the game of life – I want to be a player. Players will be sweaty and experience emotional highs and lows during the course of the action. On the other hand, officials are the critics who assess the key performers, passing comments about their moves during the game. Just like umpires in tennis are so well dressed, critics are always looking good. They never get their hands soiled, never sweat and are better at using their mouths than their hands. Critics are self-appointed umpires to successful people and they never attempt anything laudable – they live a passionless life that is not devoted to anything remarkable. They are satisfied with the normal order of activities; take little or no risk at attaining something unusual, many times because of the fear of failing. They drift about without any definite sense of purpose and do not motivate or stir our souls about their noteworthy goals or achievements. In summary, it’s the players and not the umpires who stand a chance to win awards and laurels in life. I prefer to be the former. What about you? I want to be a player indeed. I was extremely inspired by your post. Glory to God for the opportunity to inspire you today. And you know, being a player could be tasking. We would need the right kind of people to remind us to stay focussed during times that we’re tempted to drift. But the process always pays off, leaving us better mentally, socially, physically and spiritually. So true…..I am grateful for the reminder! How Sudden is Sudden Success? Leke VoL on How Sudden is Sudden Success?